Both runways apparently closed, ATIS saying AFRS Cat Zero. Last edited by chevvron; 12th Jul 2013 at 16:32. Pilots are being asked for preferred alternative airports - something to do with "fire cover"?? The word on Tw*tter is that it's an Ethiopian Airlines aircraft on fire. Last edited by wb9999; 12th Jul 2013 at 16:06. Last edited by kuningan; 12th Jul 2013 at 16:06. 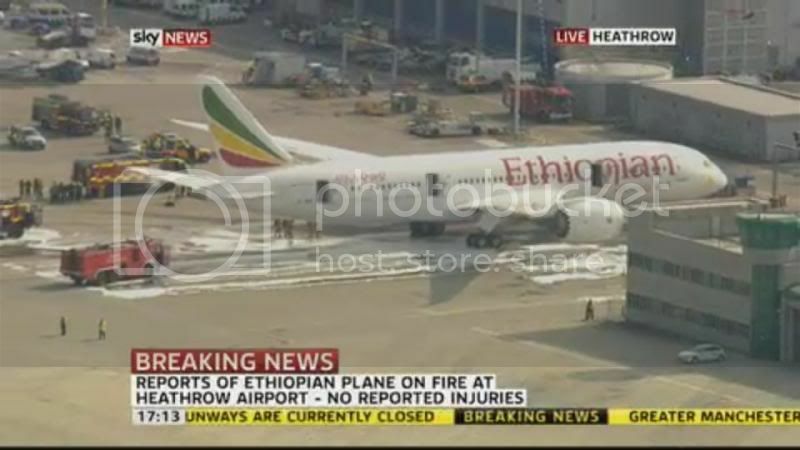 Hearing talk of Ethiopian 787 fire?!? @HeathrowAirport "Due to an incident on an aircraft, arrivals and departures are currently suspended. @metpoliceuk advise that no passengers are on board." @FlightRadar24 "Latest reports says it's Ethiopian 787 ET-AOP"
sky news showing ethiopian airlines 787. saying fire towards the rear of aircraft. looks as though it is out now. could it be the infamous electrical panel in the back???? Sky news currently showing live footage from helicopter of the aircraft parked at gate, entry doors on RHS open (no slides), no signs of damage certainly to RHS but lots of water/foam on the ramp below the aircraft and fire crews in attendance but no obvious signs of "urgency". Crews now appear to be carefully examining lower rear RHS of aircraft with ladder in place against hull side but hold doors remain closed. Last edited by wiggy; 12th Jul 2013 at 16:23. Also a TOM 787 returning to MAN after holding for 3 hours over the Irish Sea. Just flown downwind and had his gear down at about 6000 feet. Not sure how long it's been down for but could point to a hydraulic issue. The Daily Mail's going to have a field day over this. Why close the airport if plane at the gate and fire is out? lack of fire cover and foam. Last edited by stuminisprite; 12th Jul 2013 at 16:19. The little details that are so easily forgotten - by those who don't work in that environment. If foam is used, as it looks like quite a bit, what happens to the airframe / electrics. Is it easy to put back into service again? Doubtful that they'd deploy foam (or water) unless there was an active fire. That's more likely to delay it getting back in the air. Last edited by LookingForAJob; 12th Jul 2013 at 16:33. Runways are closed because in the event of another emergency, fire crews would be unavailable as they are dealing with the current situation. The fire damaged hole in its roof near the tailplane will probably do more to delay it getting into the air again! It looks from the photo (and I realise that appearances can be deceptive) like a pretty minor event, quite surprised that an airfield the size of LHR can't cope with that and still provide enough fire cover to at least keep one runway open.